Are you qualified as a reflexologist? Any advice for the rest of the day after treatment? Do you have to have a specific condition to have reflexology? Is it safe / suitable for everyone? Why do you need to know about my medical history? What medical conditions may prevent me from receiving reflexology? Is reflexology painful? Will it hurt or tickle? Where do your treatments take place? Is there any published research on reflexology? Reflexology is a non-intrusive complementary health therapy, based on the theory that different points on the feet, lower leg, hands, face or ears correspond with different areas of the body. Reflexologists work holistically with their clients and aim to work alongside allopathic healthcare to promote better health for their clients. In the 1930’s, Eunice Ingham, (the founder of modern Reflexology), further developed and refined the zone therapy into what is now known as reflexology. She observed that congestion or tension in any part of the foot mirrors congestion or tension in a corresponding part of the body. Thus, when you treat the big toes there is a related effect in the head, and treating the whole foot can have a relaxing and healing effect on the whole body. Eunice Ingham believed that by applying pressure through massage, stretching and holding the feet or hands the body could be bought back into balance giving a feeling of well being Reflexology is safe, natural and non-invasive, providing more than just physical benefits as it deeply calms and balances your entire mind, body and spirit. Reflexology is one of the UK’s most popular therapies. An initial consultation will take 1 hour 15 minutes to allow for the clients medical and lifestyle history and follow on treatment sessions will take 1 hour. Yes, I trained at The London School of Reflexology at Regents College in London and qualified in 2007. 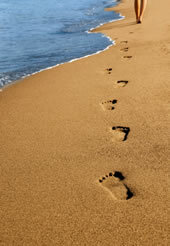 I am a Member of the Association of Reflexologists (MAR) www.aor.org.uk. I hold an ABC Level 3 Diploma in Reflexology and an ITEC Diploma in Holistic Massage. I was taught by Louise Keet who is regarded highly in the Reflexology profession and has recently published 2 books and written many articles and papers for national newspapers and magazines on Reflexology. All members of the Association of Reflexologists must undertake ‘Continued Professional Development’ (CPD) as a condition of membership. This means that I keep up with developments in Reflexology and complementary health, attend advanced courses to develop my skills and be part of other local professional groups. I have also trained in Pregnancy Reflexology (pre- conception, pregnancy and postnatal), Spinal Reflexology and Advanced Reflexology Techniques (ART) with Tony Porter. Clients react in different ways to treatments and at different stages of the treatment plan. You may have a feeling of wellbeing and relaxation or you may feel quite tired and drained emotionally but this is will pass and is part of the healing process that reflexology works on. It is important to feedback any reactions to your reflexologist on each visit as it tells the reflexologist how you are responding to the treatment. To gain the maximum benefit from your session, take it easy on yourself. Drink lots of water, avoid alcohol and heavy food. No. An increasing number of people are using this safe, natural therapy as a way of relieving tension. Reflexology is one of the UK’s most popular therapies. Reflexology is suitable for all age groups including pregnant women and children. After having completed a course reflexology treatment for a specific condition, many people find it beneficial to continue with regular treatment in order to maintain optimum health. There are very few contra-indications to reflexology. If you are pregnant please see my pregnancy reflexology page for further information or click here. This powerful form of reflexology is based on stimulating the spinal reflexes on the feet. The reflexologist will work on each individual vertebra reflex point to identify nerve roots out of balance. There can be times when reflexology is not advised (see next question) or it may be appropriate for you to consult your doctor before seeking complementary therapies. I would identify these at the first conversation by telephone or email or at the first consultation, and the following is a guide, but not a complete list. Some foot infections, high temperatures, recent surgery or history of thrombosis, some heart conditions, epilepsy, some diabetic complications. Each treatment plan is unique to the client and will vary depending on the client’s needs and conditions. To gain the most benefit from reflexology it is recommended that you have 4-6 treatments on a weekly basis to start off with, and then have monthly appointments. It is a very relaxing and therapeutic treatment while the feet or hands are being worked. Reflexology generally does not tickle even when a client is very sensitive or ticklish. I have a dedicated room that is very peaceful and tranquil allowing you to fully relax and benefit from the treatment. Yes. These make a lovely present for friends and family. 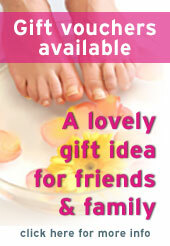 They are produced by the Association of Reflexologists (AOR) and look very smart to give as a gift.